It’s hard to criticise a film that is about someone’s life, even harder when that someone is as prestigious as Martin Luther King. While the film is a fair portrayal, it’s not nearly as good as it should have been. The shame of the whole thing is that every white actor in a main role is a household name. Even the ones you don’t know the name of, you’ll swear you’ve seen in something else before. However, other than the underused Oprah Whinfrey and Cuba Gooding Jnr I could only place one or two others from the black cast. I couldn’t see this film as a storytelling biopic, but more of an illustration of how far Hollywood still has to go. That said, the cast make a sound effort with the script. Tom Wilkinson is never a chore to have on the screen and David Oyelowo makes a fine transformation as Martin Luther King- seen best when he’s giving a powerful speech. However, a lot of the remaining cast are under used and under developed. 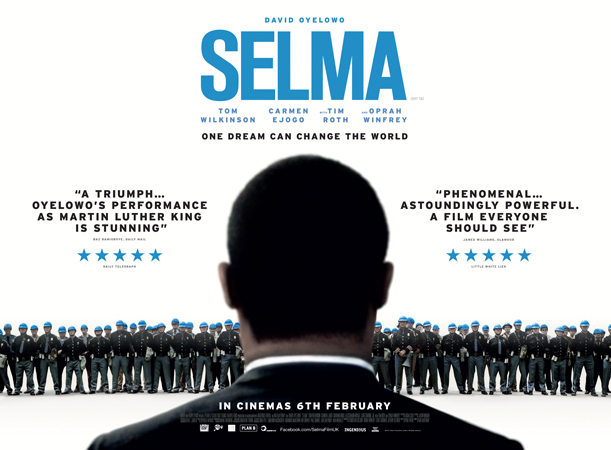 It’s rather interesting that this film chooses to focus not on the iconic bus boycott that led to King’s famous I have a dream speech, but instead on the protest to gain all black people the right to vote. No flashbacks to his early life; it smartly assumes if you’ve put your bum on a seat- you know who this man is. It’s such a shame then, that the film seems heavy with dead weight plot and in a desperate need of a good editing session. Malcolm X is almost vilified and glosses over the contact he has with King. While I like the connections and the commentary of how polar opposite they were at times, they did not truly reflect Malcolm’s evolution after Hajj. It’s a shame because I would have liked to have seen a truer, deeper look into that relationship. The film certainly will interest anyone studying the civil rights movement, but there is no feeling of inspiration, motivation or even achievement that you perhaps would get if looking at King’s Pre-dream era.